Safety PLCs are special controllers built and certified to meet international safety requirements such as NFPA 79, IEC 62061, IEC 13849-1 or IEC 61508. All of these safety standards define levels of risk reduction. 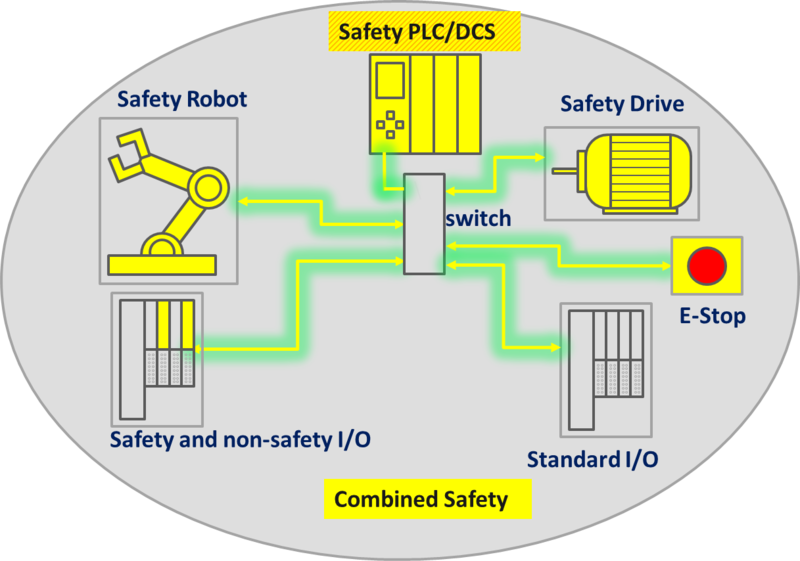 The original safety PLC concept required that normal PLCs and standard I/O could not be mixed with safety PLCs and safety components in the same network. This approach resulted in duplication of wiring for safety and non-safety functions and the added headache of coordination between the two separate systems. This approach is sometimes called “conventional safety” and is illustrated in the following figure. Maintaining separate bus wiring for both the standard PLC and I/O and the safety PLC and I/O proved to be expensive. Using only the safety PLC and safety I/O to handle standard and safety I/O was also expensive(Safety I/O is quite a bit more costly than standard I/O, if safety is not required, why pay for it?). The best cost savings came with the idea of sharing the safety PLC and I/O bus for both safety and standard functions. Combining the safety and non-safety components in one system can save significant wiring costs. Using one safety PLC for all PLC/safety functions allows a single engineering tool for all programming. The combined approach saves costs and lowers the confusion factor associated with having multiple programming tools. PI created PROFISafe, the communication part of a combined safety system.